In this district, there is a huge price differential. Ingleside is more affordable, with more modest homes. This area is in transition-changing rapidly. Ocean Ave is the main commercial hub, which has changed tremendously in recent years. Whole Foods as the most recent addition has really changed the area. Pine Lake Park, adjacent to Stern Grove, is known for its Parkside like detached homes (district 2) with higher prices. 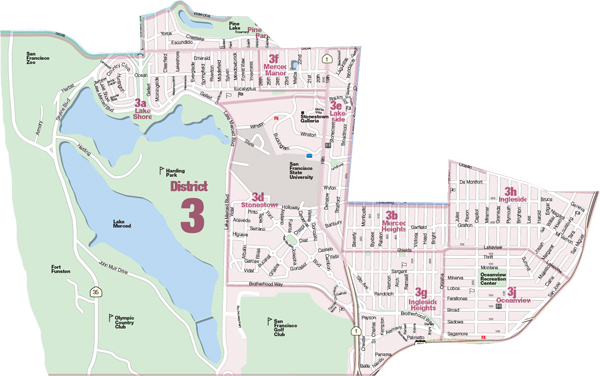 This district is also home to Stonestown Mall (the Lakeside Area), and is considered suburban, with its tailored, traditional, detached homes. Many homes were built starting in the 1940’s.